Changing into my boots after 3 turns on the rink was a glorious feeling. However, gliding awkwardly on the ice rink before turning 50 was even glorious. 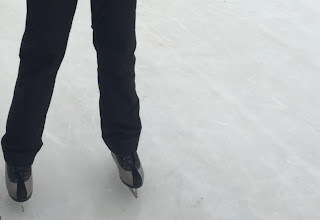 Let us forget about the awkwardness and focus in the moment when I finally decided to get those pair of ice skates and tried to glide and at the same time hang on to the railings that surround the rink. Of course, I was hesitant at first. Thinking about those tiny human beings on the ice rink, effortlessly doing their stuff. Excitedly turning... Skating without a care in the world. How would I glide without hurting anyone? Will their helmets protect them from this woman reluctantly skating in black pants? My gals were so thrilled and really helpful. Taking my hands and encouraging me to skate near the center. Not yet girls. Perhaps not today but Nanay will get there slowly. Maybe not like Michelle but definitely ready to have fun,smile at strangers who give encouragement and confident enough to glide without a care in the world or even her ageing knees.